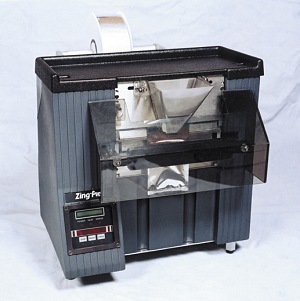 The ZP-300P bagging system is the ideal bagging system for creating, filling, and sealing bags made from barrier film tubing such as polyester, metallized polyester, foil, nylon, anti-static, and polypropylene. With its patented process, it allows users to economically create packaging that provides a vapor or moisture barrier, keeping the product inside fresh and protected! Call Us for Access to a ZP-300P Bagger Video! Seals Barrier Films that Autobaggers will NOT! Simple Netbook (included) User Interface / Controls: Includes Job Storage, Counting, etc. Economical: Priced well below VFFS Machines & Pre-made Baggers! Quick Changeover: Average Changeover Time is Five Minutes! 20" x 23" x 31"
Similar to Bags-on-a-Roll … But Better– Barrier films like polyester are not available in the bags-on-a-roll format, but Zing-Pac has the solution … and it’s a better way. Using economical barrier film tubing, the ZP-300P’s patented process creates, opens, and seals bags. In other words, when it comes to barrier film bagging, Zing-Pac is THE choice! See our Smaller Semi-automatic Table-top Poly Roll Baggers, CLICK HERE!